Priyakna excels as a licensed property manager and is responsible for a variety of asset management roles within the organization. She provides a valuable diverse skill set in knowledge-based customer service, strategic organization and a keen attention to detail – which allows her to provide the best possible service to clients. 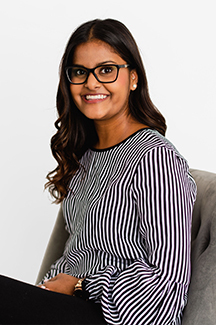 In addition to her work experience, Priyakna holds a dual diploma in business administration, specializing in human resources management, and general business management from NAIT.